After the formative years of porcelain production in England during the 18th century, the 19th century saw something of an explosion in both volume and in producers, very much a mixed bag of quality and quantity. 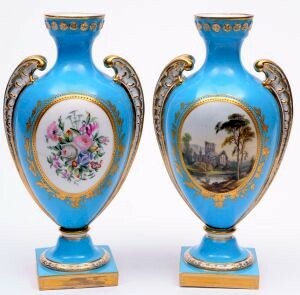 A pair of Coalport vases, circa 1765-70. Geographically diverse, there were the 'bigger' concerns that were formed before the century started, namely Minton (Stoke on Trent), Coalport (Shropshire) and Derby, which were still in business during the twentieth century. Their output followed the desire for tea, dinner and table ware as well as decorative wares and figures with influences ranging from the Orient to the rather florid neo rococo. 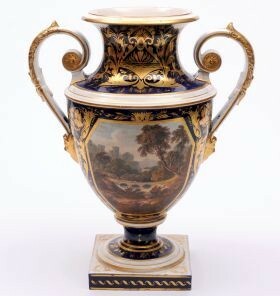 A Derby porcelain topographical vase, circa 1820-30. 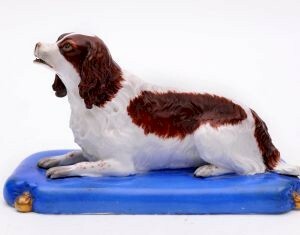 Wedgwood and Spode (both within the five pottery towns) likewise spanned the century with an equally broad output, but whose repertoire also included pottery and there was also, of course, the most diverse of all the 19th century producers Doulton (Lambeth). Founded in 1815, they not only made porcelain but art pottery, sanitary wares, architectural pieces, tiles, figures, dinner ware - in fact, pretty much everything. There was also a number of relatively short lived concerns that have subsequently 'punched above their weight' in desirability terms. One of these was Rockingham (near Rotherham), which for much of the first half of the century produced high quality tea and table wares, with some plaques and figures – its reputation was such that the term Rockingham has been overused to described poorer quality lookalikes from rival concerns. However, it could be argued that the highest quality 19th century porcelain (outside of the Worcester concern) was made during the first two decades at Swansea and especially nearby Nantgarw. The roll call of decorators there was second to none including William Billingsley, Thomas Baxter and William Pollard. 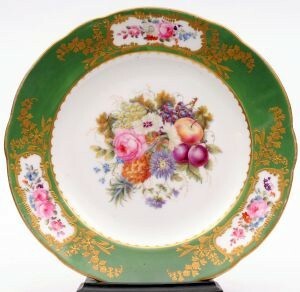 A Nantgarw London decorated plate (1814-23). Of course, there is the soul hard paste factory, the Cinderella concern of New Hall that lasted into the 1830s along with a number of other Staffordshire concerns among them Davenport, Miles Mason, Samuel Alcock, H & R Daniel, John Ridgway and many others, some of better quality than others but all competing for their corner of a growing market. Each of the factories mentioned had their own histories and evolutions, some lasting centuries, whilst others fell by the way fairly quickly. In a few paragraphs one cannot do even one of these any justice, but it is safe to say there are collectors out there eagerly scouring auction rooms, dealers stock and the internet for every single piece of it. 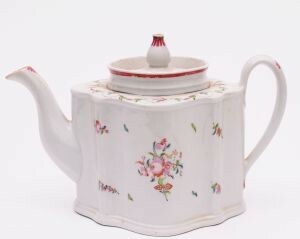 A New Hall porcelain teapot circa (1800).